Carrot Cake just isn’t for dessert anymore! 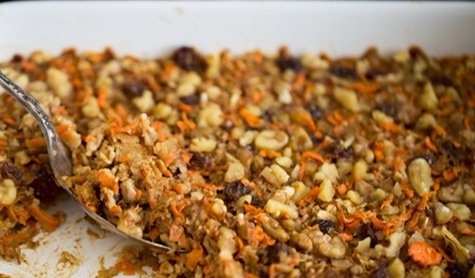 Made a healthy baked oatmeal out of carrot cake ingredients. Nummy!!!! Preheat oven to 375F and lightly grease a 10-cup/2.5 qt. casserole dish. I used an 8″ x 11″ rectangular casserole dish. In a large bowl, mix together the rolled oats, cinnamon, baking powder, and salt. Pour mixture into prepared dish and smooth out with a spoon. Press down on the oatmeal with a spoon (or your hands) so the oats sink into the milk. Sprinkle on the walnuts and raisins and press down lightly again. Bake, uncovered, for 32-37 minutes (I baked for 35 mins.) until lightly golden along edge. The oatmeal will still look a bit soft or wet in some spots when it comes out of the oven, but it will firm up as it cools. Let cool for about 10 minutes before serving. Garnish with Coconut Whipped Cream, a drizzle of maple syrup, or some non-dairy yogurt. When the baked oatmeal is fully cool, it will firm up enough to be sliced into squares. Leftovers should keep for 3 days or so in the fridge or up to 2 weeks in the freezer. For a nut-free option replace the almond milk with a nut-free non-dairy milk, such as coconut milk. Omit the walnuts you can try sunflower seeds or pepita seeds for a crunch.